The unique snap-lock Chain-link design allows any pitch length to be fabricated in a matter of seconds without splicing, master links or special tools. This makes for a versatile drive that can fulfill a number of different requirements. These drive components exhibit outstanding resistance to a wide range of chemicals and solvents. The ability to operate in high humidity and corrosive environments can be an added benefit in many applications. 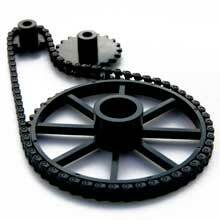 The Chain and Sprockets are pre-lubricated and so can run without the need for oil or grease. Sprocket weights ranging from 0.26g to 2.7g(0.009 oz to 0.097 oz) reduce system inertia. Although the Chain weighs a mere 1.9 gm per 30.5cm(0.067 oz per foot), it can operate with a running tension up to 9N(2.0lbs), ultimate breaking strength is 31N (7.0lbs) at 22°C (75°F).